View More In Window Hardware Sets. Create the look of an upscale, custom window treatment without an interior designer or the expense. Designer Hardware collections add style to any window treatment, featuring the highest quality decorative drapery hardware with handcrafted finials in versatile and sophisticated finishes. Constructed from solid wood and resin, the Ella Drapery Rod Set includes everything you need for easy installation. 2" diameter solid wood poles may be used with almost any drapery weight and provide the perfect solution for today's larger rooms and higher ceilings. Other finial styles and rod set sizes are available. Complete your unique window design with coordinating holdbacks and rings; sold separately. The Ella Drapery Rod Set is also available in Antique Gold and Walnut finishes. 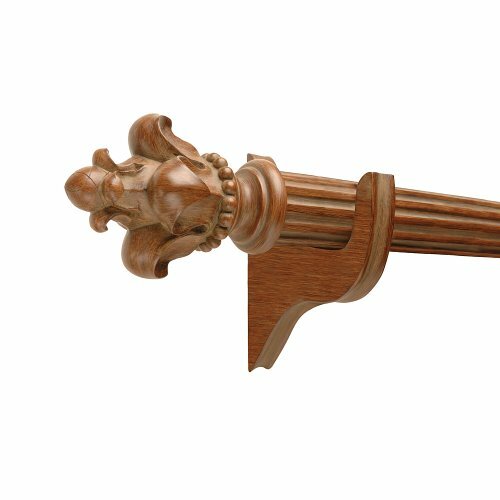 Set includes 2" diameter fluted wood pole, (2) decorative finials, (3) mounting brackets & hardware; total length with finials is 106.75"
If you have any questions about this product by Designer Hardware, contact us by completing and submitting the form below. If you are looking for a specif part number, please include it with your message. Achim Home Furnishings Royale Decorative Curtain Rod & Finial Ritz, Extends to 28-48"
Exclusive Home Acorn 1" Curtain Rod and Coordinating Finial Set, Matte Bronze, Adjustable 66"-120"